Two Eagles Lodge B&B in Union Bay was one of two finalists for the 2019 Family Business Association's Family Business Excellence (FBE) award. 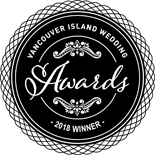 Two Eagles has been recognized as the "Best Outdoor Reception Venue" by the Vancouver Island Wedding Industry Association. 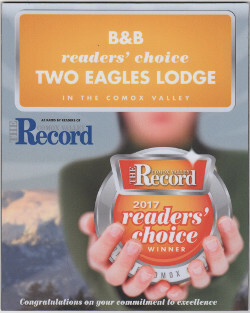 Two Eagles Lodge has been recognized as the Comox Valley's "Best B&B" based on votes in the 2017 Readers' Choice Awards sponsored by the Comox Valley Record. The B&B was honored with this same award in 2016, and was the finalist in 2015. FlightNetwork features Two Eagles Lodge as one of the "13 Bed and Breakfasts to Take You Off the Beaten Path"
Two Eagles Lodge, a waterfront b'nb/vacation rental in Union Bay, has received certification by the Canadian Wildlife Federation through its Backyard Habitat Certification Program. Certification is valid for five years. MEGA HUGE BOUQUETS to Carolyn and Steve Touhey of Two Eagles Lodge B&B's for their Chamber Mixer on June 17th. What a wonderful evening of networking and excellent food (all done by Carolyn). The finale of wonderful music (by a number of artists in the area) and continued networking and fun continued well into the evening. Article in the Comox Valley Record on the outstanding number of awards Two Eagles Lodge has won in 2011. When Carolyn Touhey was invited to present marketing workshops at an international trade convention in Vancouver, she and her husband, Steve, added a few extra days to explore the Pacific Northwest. Little did they know how life-changing that trip would be. See Dan Hill, Ron Irving, and Steven McClintock in person at Two Eagles Lodge. Seating is limited so book early. North West Dive News article on the incredible dives just off Union Bay and neighbouring Denman and Hornby Islands.